Large format (LF) exhibitor IMAX is slowly pulling the curtains back on its long-gestating plans for digital cinema and how to hang on to the 3D cinema market segment, just as digital 3D is about to go mainstream with ‘Beowulf‘. Few people remember that IMAX was once going to conquer the digital cinema space when it bought UK projector maker Digital Projection International (DPI), which was on of the the three DLP Cinema(TM) licensees. Having failed in this venture and hived off DPI to NEC (who have made an only marginally better job of it), IMAX promised that they would still show the world IMAX-digital with their super-secret projector project. Then things went quiet for a long time. Until now. Imax previously pointed to late 2008 and early 2009 as the likely rollout dates for its digital projection technology. After the first six digital projection systems meet unspecified “performance specifications,” Imax said it planned to proceed with a full rollout in the last half of 2008. The Imax digital projection system, now in development and trials, will enable theaters to receive movies on a hard drive for digital projection. That eliminates the need for costly and heavy Imax film prints that require loading via forklifts on clunky projection systems. No further details about the technicality of the system were revealed, but initially it was stated that each screen would be fitted with two Sony 4K digital cinema projectors, coupled with custom lenses, a high bandwidth server and Imax Image enhancement engine. This fits in with previous speculation and rumours about IMAX’s plans. It also makes sense from a technical perspective because two IMAX projectors aligned would give enough brightness for a large format screen and also enable 3D with each projector providing left eye/right eye image. However, if I was Sony I would NOT be trumpeting this use of their technology, because it risks giving the perception that 4K is specialised large format (LF) standard for a niche market at a time when they want to compete with DLP 2K for the multiplex mass-market. However, from a quality perspective it is true that 2K is closer to 35mm release print quality while 4K is closer to 70mm. It also highlights that at the moment you need two Sony 4K projectors to display digital stereoscopic images. But we won’t know the details for sure until 2008. 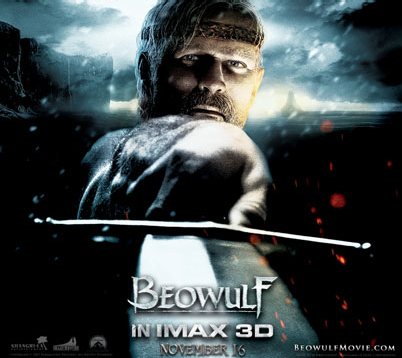 In the meantime IMAX have been quick to make sure that they too are part of the expected ‘Beowulf’ 3D bonanza by announcing that the film will go out in both digital 3D and on IMAX (traditional film) 3D. Having been the first to mass market 3D with ‘Polar Express’ IMAX have still not forgiven DLP digital cinema from snatching away the 3D crown in recent years and even went so far as to attempt to sue digital 3D companies In-Three – but failed. In the meantime IMAX has been picking up new exhibitor deals, including a major one with Regal and even in Morocco. But the spine-tingling moments weren’t when Ray Winstone, playing Beowulf, thrusts his sword at the audience — a 3-D cliché from the ’50s. They came when he faces a digitally enhanced Angelina Jolie playing the mother of the monstrous Grendel, in a dank, forbidding cave. Jolie makes for a stunningly seductive sorceress, so it’s all the more terrifying when her features momentarily morph into a death mask. A 3-D sword can make you jerk back in your seat, no question. But 3-D is even better when it draws you in — into the endless shadows of a cave, or into the vortex of a shrieking face. Hollywood is betting that audiences will feel the same way. Not just Hollywood, but IMAX and a lot of cinemas and equipment makers too.